Siteground is a privately held web hosting company that was founded by a group of University friends in the year 2004. For the initial years, they continued to operate from the university dorm rooms and today nearly 13 years after their humble beginnings, they have progressively turned the company into a flexible web hosting organization that offers solutions and experience very different from the usual run-of-the-mill hosting companies. Currently the company is being led by Tenko Nikolov (CEO), Reneta Tsankova and Nikolay Todorov. Siteground has 5 data centers located in 3 continents (America, Europe and Asia-Pacific), employs close to 300 staff members and globally hosts over 450,000 domains (at the time of writing) with this number increasing by the hour. Shared hosting plans from Siteground start at a price of $3.95 per month and come with an array of features including cPanel interface. The set of essential features included with all plans are a free website builder, SSH access, Cloudflare CDN, app installs, daily backups, unlimited emails and databases. Additionally, customers can request a free transfer of their website from another webhost. A set of premium features are available with GrowBig and GoGeek plans that include SuperCacher, 1-year free SSL certificate, PCI Compliance, Priority Customer Support to name a few. Siteground offers fully managed cloud hosting solutions for those who need more space, faster performance and capability to scale-up (which cannot be satisfied by shared hosting). You have the option to choose from 4 cloud hosting plans – Entry, Business, Business Plus and Super Power plans, based on the number of CPU cores, RAM requirements, diskspace you need and traffic bandwidth that you would want to be included in your plan. Cloud hosting packages are priced starting at $80 a month and go up to $240 a month. 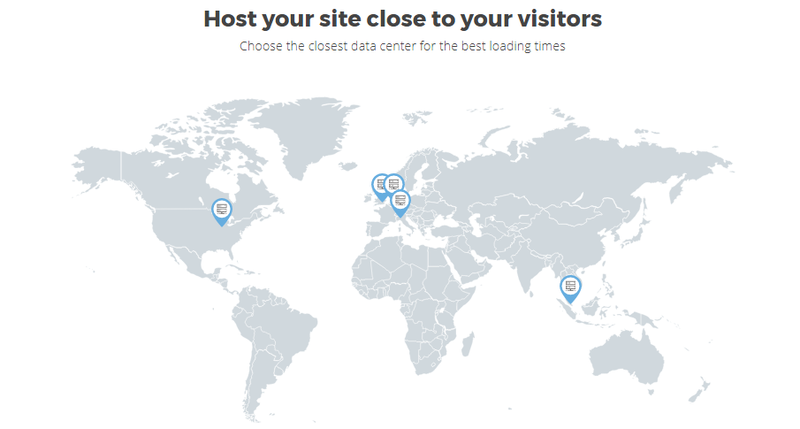 As on date, Siteground has five data centers in 3 different continents. At the time of purchasing hosting, Customers can pick up a server location closest to their visitors that results in fastest page load times. Read real Siteground customer reviews here. Siteground GrowBig plan can be obtained at just $5.95 per month, which is 60% OFF the regular price of $14.95/month. Also the most advanced GoGeek plan is available at 60% OFF from the regular price of $29.95, and can be purchased at $11.95/month for a limited time period.